When Crocodile Dundee has nightmares, it's not giant reptiles he fears. It's this scary bugger. If it were revealed that irradiated eucalyptus had spawned a horde of undead koalas, we'd have to regard this as evidence. Too bad that it's only an excellent Photoshop job. So, until that Down-under version of apocalypse inevitably hits, Fosters-fueled fantasies involving shotguns, razor-edged boomerangs and Michelle Jenneke will have to wait. The scary looking image of a wet koala with nasty-looking fangs went viral on Facebook earlier this month, raising speculation about its authenticity. 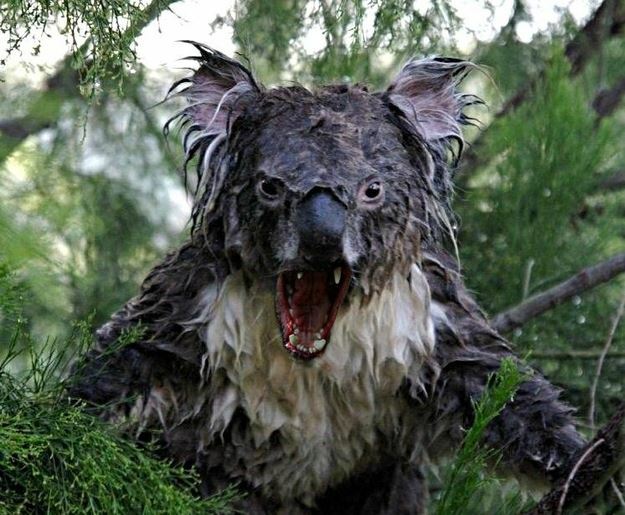 NowPublic revealed the hoax by uncovering the original, super-adorable wet koala image. HuffPost reached out to the photographer who snapped the picture of the wet koala in 2009, who goes by the Flickr user name "Oz_drdolittle," but didn't hear back as of press time. A Reddit thread from July 17 also acknowledged the hoax, and suggested that a dog's jaws had been superimposed over the image of the koala.